Any effective business owner knows that their staff is the foundation and in many ways, the very reason for the success of their brand. Without their team, it would be impossible for them to reach company goals, satisfy customers, and beat out the competition. When employee morale is low, it can bring the entire company down which is why it is vital for leaders to continually encourage their staff to remain productive. Below are a few proven ways to consider. The work-life balance can be difficult to juggle for many of your employees. When they’re backed into a corner where they feel like they have to choose between their professions and their families, it can lead to slowed productivity. You can provide some relief as an employer by offering more flexible work schedules. By allowing your employees to choose the schedule most convenient for them, they are less tempted to call out when their family needs them most. If your company is set up for it, you might even consider allowing them to work remotely on occasion so they can better balance their jobs and their personal lives. Nothing feels better to your staff than knowing that you appreciate them. Though you’re appreciative of them, it can sometimes get lost in translation with the day to day stresses. You can show them that you’re watching and grateful, by starting an employee recognition program. One example that has been used by many organizations would be to have an employee of the month program where the staff who shows the most progress gets their photo posted in a general area where everyone can see it. The holidays can be a very stressful time for your staff. If you want to get into the spirit of the season, you can give them the gift of bonuses or other incentives. Perhaps during November and December, you hand out turkey coupons for a discount on turkeys or ham for the holidays. You might also consider giving out a bonus to the workers who generate the most sales or brings on the most clients. A little friendly competition can do wonders for your workplace. 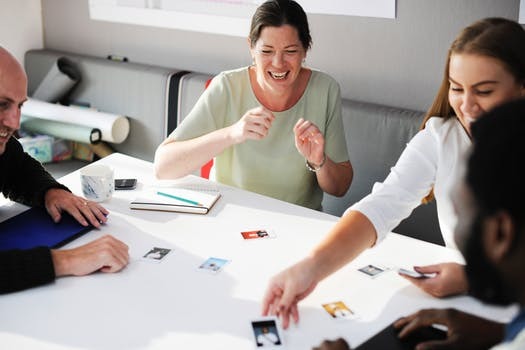 Work with your human resources department to come up with some fun ways for your employees to interact and be more productive. You can set sales goals and group your staff into teams to see who gets the most. You might also consider going out of the office for a company sports competition where they can bring their families and participate in baseball, soccer, basketball, or tennis. The winners might get the rest of the day off or comp time to use in the future. Sometimes slowed productivity can be due to lack of knowledge or limited knowledge of company policies and procedures, software, or equipment. The best way to encourage your team to stay productive is to make sure that you offer them an opportunity to improve professionally. Sending them to local training or allowing them to return to school for college credits and degrees shows them that you care about their professional development and can help expand their knowledge. If you ask dissatisfied employees why they leave their jobs or don’t put their best foot forward, more times than not, their response is that there’s no room for growth. If you want to encourage productivity in the workplace, it is imperative that you create opportunities for your staff to move up the corporate ladder. You can use performance evaluations and management feedback to determine who deserves and is qualified to be promoted. They will essentially do their best work with the hopes that they will be next in line for a higher-paid position. Everyone enjoys a few perks. However, when those perks and incentives can be used outside the office in their personal lives, it makes it even better. You can offer things like discounted gym memberships, gift certificates to popular stores, discounts on movie tickets, and other incentives. Keeping your employees motivated to do the work each day is an ongoing task. Simply offering good health benefits and a good starting salary isn’t enough. If you want them to do their best, it is imperative that you invest in their well-being, personal, and professional development. In showing them that you appreciate them and see them as more than just workers, they will be encouraged to give it 100% every day.